Merlin Metalworks has announced an entirely new line of racing inspired bikes, dubbed "Works," for 2006. The Merlin TiWorks series will join the existing Merlin models, which continue as Merlin Classics. Merlin also has a new CarbonWorks bike, the C110 Works. Many of Merlin's traditional touches are present in the TiWorks line, including 6Al/4V titanium alloy dropouts, size-specific tubing selections and, in the road frames, geometry by Tom Kellogg. But the line also boasts its own touches, not the least of which are lower prices across the board than the Classic bikes. 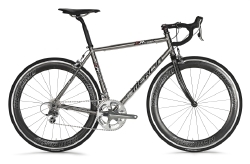 MX MTS titanium shaped tubing is a first for Merlin and is most noticeable in the top tube and down tube, and more subtly in the formed chainstays, which are larger and stiffer than the Classic stay shape. The introduction of frames crafted from 6AL-4V titanium tubing is also a new to Merlin and is quite nicely presented in the CR 6/4 TiWorks.